Palace on wheels is one of the top ten luxury train journeys on the globe. Palace on wheels is the first ever luxury train in India, which has its own royal background. It was the personal railway coaches for the former rulers of princely states of Gujrat, Rajputana and Nizam of Hyderabad. After independence it was started as Palace on wheels luxury train, named due to its rich interiors, only in 1982. Since then it has got improvised twice in 1990 and 1995 owing to its popularity. Now it is more comfortable still vibrating with old royal charm. 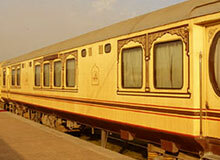 Palace on wheels has 14 saloons attached with showers. Each saloon has got its name after princely states of Rajasthan and has interiors matching the colorfulness of royalty of Rajasthan. The palace on wheels has well appointed library, lounge, bar and dining car. In each saloon, there are four coups i.e. sleeping rooms attached with toilet. There is one attendant in each saloon to take care of personal needs of its guests. Apart from this, each saloon has a small pantry attached to it ready with tea, coffee or snacks. Palace on Wheel tour takes you to the princely states of Rajasthan in just 7 days in addition to a trip to majestic Taj Mahal in Agra. This royal journey on palace on wheels starts on every Wednesday evening in Delhi and ends on the following Wednesday early in the morning. Indiaprofile.com offers you the online information about the palace on wheel train tours. For more information or for booking of the palace on wheels tour, fill and send the form given to us.